Fitting a filtered faceplate (which costs less than £10) can substantially increase broadband speeds, particularly if you have telephone extension sockets. If you make only one tweak, please may it be this for an ADSL or ADSL2+ service! Simply remove the standard faceplate on the NTE5 BT master socket and replace it with a filtered faceplate. In most cases, this makes a dramatic difference and it's cheap! This is probably one of the biggest secrets in the broadband industry. You can throw all those micro filters away! As described in our ADSL faceplate page, there is substantial evidence that shows that filtered faceplates can dramatically increase broadband speeds, and yet the vast majority of consumers are not aware of their benefits and do not use them. Filtered faceplates are automatically fitted as part of the installation of fibre broadband (unless a self install option has been chosen). 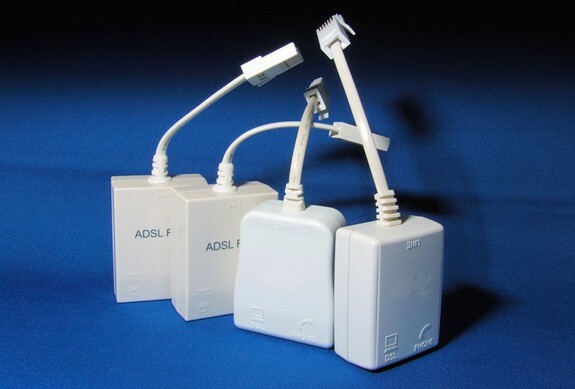 When most people set up their broadband connection, they go round their house and plug in micro-filters (which were provided with the modem or by the ISP) in all phone extension sockets as well as the BT master socket. Doing this can involve a significant number of broadband filters (which can look unsightly), and it is essential that there is a filter plugged into every single phone socket, including the one used for Sky's set-top box (if you have one). You don't need to do this, and there is a better, cheaper solution. All you need to do is unscrew the standard faceplate on the BT master socket, and fit a filtered faceplate. This simply fits over your BT socket. It is totally legal and supported by BT. All this device does is separate your broadband signal from the rest of your house telephone wiring, reducing interference and noise. An extra benefit of this faceplate is that, since ADSL filtering is now taking place at the BT master socket, there's absolutely no need to put any filters on your telephone sockets throughout your property, providing a truly elegant solution. To make it easy for you, you can buy a high quality ADSL faceplate through Amazon on the left at a low price.